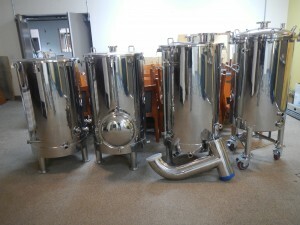 Our all electric automated 2 barrel brewhouse has finally arrived. This Brewmation system will speed production and will also remember my recipe! The tanks you see are (from left to right) the Hot Liqueur tank, the mash tun, the boil kettle, and the brite tank. 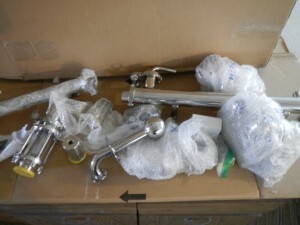 The large bent pipe is a condensate stack. The other picture is an array of shiny accessories including a RIMS tube, a device for injecting oxygen into the wort, a CIP ball, and a whole bunch of fittings. T-Shirts are on Sale! Fermentation vessels have reported for duty.